Examines the causes and effects of -- and then remedies for -- suburban sprawl. Vibrant towns or sprawl? 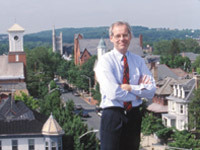 Small town newsman (and Pulitzer Prize winner) Tom Hylton explores how America can save its cities, towns, and countryside in this one-hour program. Save Our Land, Save Our Towns taps into a growing concern about sprawl among ordinary Americans. A poll by the Pew Center for Civic Journalism recently found that sprawl ranks with crime, taxes, and education as the top domestic concern of citizens across the country. Americans are frustrated with traffic congestion, angry about the loss of open space, and perplexed by the decline of America's cities. Many think sprawl is inevitable. But it's not. Save Our Land, Save Our Towns is a story of hope -- logical reasons why America's towns can be rebuilt and its countryside preserved from strip malls and subdivisions. The program is designed to be engaging and personal -- a voyage of discovery, rather than a mere recitation of facts, with moments of revelation, humor and emotion. Filmed in Pennsylvania, England, Oregon, and North Carolina. "Development and zoning issues normally make the eyes glaze...Tom Hylton makes them downright fascinating...You'll never look at a city or suburb the same way again." "This superb documentary examines causes and effects of...expanding suburban sprawl." "Brightly written, tightly organized and cleverly illustrated, and if Hylton doesn't have suburbanites hanging For Sale signs on their McMansions at the end of the show, he may at least have them thinking about it." "A compelling examination of the causes and effects of suburban sprawl, along with thoughtful recommendations and effective solutions for curbing the environmental and social consequences of this high-profile issue." "Save Our Lands is a valuable tool in the war against sprawl." How growth and sprawl affect the quality of life in New England, and some possible solutions. Suburban sprawl: causes and remedies. Looks at the impact on a small town when Wal-Mart plans to build a mega-store there. Good design of houses and neighborhoods builds community. Connects asthma and other respiratory diseases with air pollution and suburban sprawl. Can humans and wildlife co-exist in the suburbs?